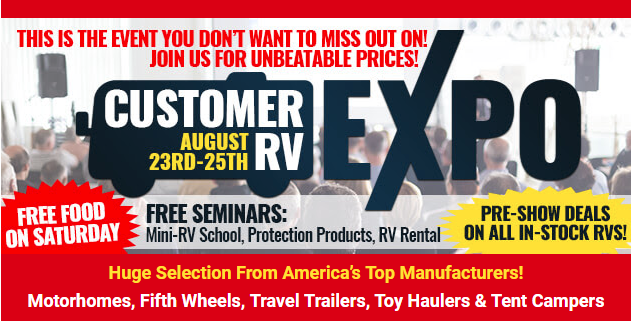 Join us at Byerly RV this August 23rd – 25th for our once a year 2018 Customer RV Expo! Get unbeatable pre-show RV deals on all the latest RV brands and models by top name manufacturers such as Keystone, Forest River, Thor Motor Coach, Tiffin and more! At our RV Expo you can look forward to amazing pre-show season prices on our huge selection of Class A and Class C Motorhomes, Fifth Wheels, Travel Trailers and Toy Haulers. In addition, we also have free daily seminars, games, prizes as well as free lunch on Saturday, August 25th! Bring your family and friends. It’s an RV party! At this special Byerly RV Expo event, you will get better than RV show sale prices and still have time to enjoy your new camper for end of summer and fall camping fun! Since 1948, we have been selling the best RV brands at the best deals to campers in and around St. Louis, Missouri. With 70 years of experience, Byerly RV is a name you can trust. Mark your calendars for August 23rd, 24th & 25 for the Byerly RV Customer RV Expo event. We look forward to seeing you at Our Dealership Location for new RV fun, spin to win RV parts prizes, food, festivities and more!